I have loved menswear from an early age. In high school, most of my dressy clothes were suits, shirts, vests and sweater-vests. I bought a pair of brown wing-tips when I was in 10th grade. And it's not about looking like a boy--look at Marlene Dietrich and then tell me menswear has to look boyish. No, it's about style. There's an authority present in a suit, no matter how boxy or tailored. More to the point, there's a crisp grace in the look. If you've seen a well-made (and expensive) suit, you know what I mean. It looks right. And it looks beautiful. If you know me at all, you know I'm all about what's beautiful. I've been quoted saying that the theological concept of the Trinity never made sense to me until a professor suggested that 3 persons was elegant. What something looks like is, for me, at least half of its meaning. Thus, though Across the Universe is not the most brilliant plot, it is beautiful and therefore I loved it. Guernica or The Sparrow are powerful and transformative precisely because of their beauty. Sometime in high school, I saw Annie Lennox on MTV wearing a brown and cream pinstriped suit with burgundy velvet collar and red Chucks. I immediately went to Salvation Army and bought myself a brown and cream pinstriped suit. One of the guys I had a crush on my senior year wore orange Chucks with his tux to prom. I've noticed Ellen DeGeneres wearing sneakers with her tailored jackets and slacks. The current Doctor Who does the same and is based on Jamie Oliver's ensemble on the BBC. 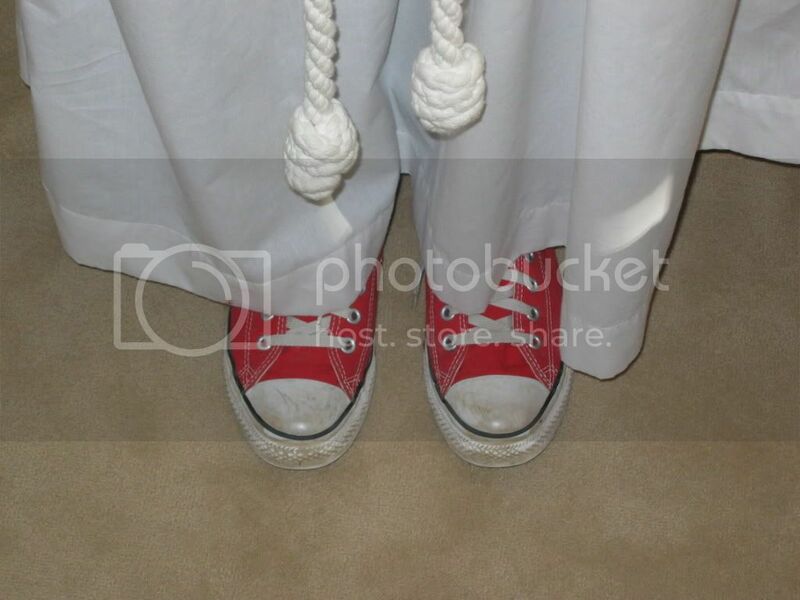 Knowing all this, is it any surprise that I wore red Chucks to preach in for several years? I've been struggling with my look as a priest for some time now. I don't like neutrals, I don't like pastels, I don't even like jewel tones. I love bright colors and contrasting patterns and textures. I'm an artist and I see my daily wardrobe as a kind of canvas. As a priest, however, my look says something completely different. If I go into a meeting or hospital room in purple gingham palazzo pants, a fitted brown turtleneck, and a green bucket hat, people don't see "priest," they see "funky clothes" or similar. More to the point, the clothes become a barrier and the encounter becomes about me. There's a reason the black shirt and white collar is a classic. I have accepted that I need to look more professional, more polished. I have pushed against this concept, called it boring. As I look back at my sartorial history, however, it seems that I've always had that crisp grace, always wanted it. I like to tweak it a bit, but the suit, the vests, the cufflinks--they're awesome.